Today I got the WordPress android app installed, well at least the one recommended by WordPress.org website. Installation and initial setup was pretty straight forward. Text editing options are not too extensive but good enough for a quick post. Options such as enhancing your text with bold, italics, underline and crossed. Adding URL links is a brezze. Like this to ACM.ORG. Inserting photos or videos from media gallery on the phone itself is also available. Finally, specifying tags, categories and publishing settings are pretty handy as well. Certainly writing articles from my smart phone device is not the most exciting experience but it is good enough to get a story started and to finish it later on. I am going to take the opportunity to write about “Blogging Stuff” topic on my very first article on 2011. This time I have been trying to understand how to publish “Complex” tutorials using the “WordPress.org” platform and for that I mean something that goes beyond the scope of one single article or blog entry. Simple tutorials can be written entirely using one blog entry which is pretty convenient for the publisher but when the content of an subject matter is complex in nature (long text paragraphs, tons of pictures, examples, code snippets, videos and so on) then the next logical step is to break the whole into small pieces that can be assimilated or explored easily by the intended audience and still be considered atomic (one complete thing). So without a lot of research on the topic and mostly using empiric knowledge about how tutorials in general are structured, here it is an attempt to tackle just few of the issues that a good tutorial structure thrives to resolve. At the bottom of the article we need to add the navigation section, that will point to TOC that we will call “Main Index”, This blog post is also expected to point to “Previous” link that is actually “Section 2.2” page in this case. This is the first article at this level and the last element in the path so “Next” link is not available so in this case it will be gray out. At the bottom of the article we need to add the navigation section, that will point to TOC that we will call “Main Index”, This blog post is also expected to point to “Previous” link that is actually “Section 2” page in this case. This is the first article at this level but in this case is pointing to “Section 2.2” as it is the next element in the path. At the bottom of the article we need to add the navigation section, that will point to TOC that we will call “Main Index”, This blog post is also expected to point to “Previous” link that is actually “Article 1.2” post in this case. This is the last article at this level so it should not have a pointer to next but it will be wise to point to next section if available. At the bottom of the article we need to add the navigation section, that will point to TOC that we will call “Main Index”, This blog post is also expected to point to “Previous” link that is actually “Article 1.1” post in this case. This is the second article at this level so it should point to “Article 1.3” as it is next. This entry is also special on top of pointing to TOC it should point to “Section 1” as well so we will add a link just next to TOC one this time. At the bottom of the article we need to add the navigation section, that will point to TOC that we will call “Main Index”, This blog post is also expected to point to “Previous” link that is actually “Section 1” page in this case. This is the first article at this level so it should point to “Article 1.2” as it is next. At the bottom of the article we need to add the navigation section, that will point to TOC that we will call “Main Index”, This blog post is also expected to point to “Previous” article that is actually the same as “TOC”. This is the last article at this level so it does not point to Next this time. It would probably a good idea to point to the next “Section” instead but that is not part of our specification so we will leave it for spec 2.0 and will be placing a place holder by now so we remember. After all, this blog resource started as a blogging experiment. Today the last day of year 2010 the only thing I can share is my closing year blogging summary. I am pretty sure this may not be of an interest of anyone else but it will be my closing blog post and a way to compare my blogging activities next year. Blogging is a tough business !!! After several weeks of null blog writing it is time for some reflexion about the nature of the blogging business and my very first year of formal blogging activities. October 2009 was the first month I posted blog entries on this site and one of my first article’s “I have a blog, now what? briefly mentioned some mere speculation about what could it be a good Blog writing frequency and at that time a I had a goal in my mind ; I was about to write at least one article every month. Today is one year and five weeks from that very first article and the only thing I can say for sure is that “Blogging is a hard activity” of course based on my very own experience. I am trying a SPAM blocker solution for the first time on this site and I am officially on test/validation mode so …. 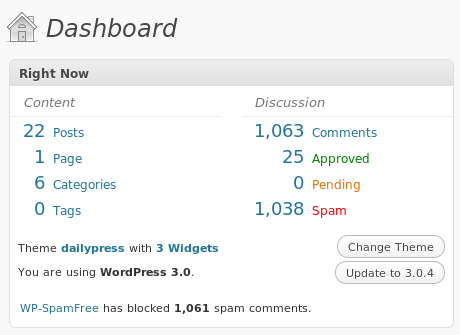 Dear SPAMBots and even the human type of spammers are very welcome to try and flood my site. NO, I am not crazy. I do really want to check if this solution works. To demonstrate that I am committed, I have also added a “Contact” form at the “About” page with no CAPTCHA or silly questions asked. I am ready to dive into messages if necessary. Give me your best shoot. SPAM is annoying, I got it. Wow, I do still not know how could I had been so patient the past 6 weeks where I in purpose stopped writing on this BLOG for personal reasons and also due I was trying to understand what is all about with this SPAM flooding affecting the miserable four blog entries I have written so far. I stop counting the type of SPAM as well as how many different languages those comments were written mainly some type of Cyrillic kind of language I assume mostly Russian or from some eastern Europe countries. Topics ranged from medicine sales, human “organs” enlargement stuff, any sort of services sales and few trying to advertise their very own blogs were I do assume all these trying to drive traffic to other websites. I FINALLY DECIDED TO STOP ACCEPTING COMMENTS ON MY BLOG POSTS !!!! Well at least I had a couple of legitimate commentators; thanks you two and sorry I am not showing your comments anymore.I am in the process to figure out a best way to handle this SPAM but that might require to install the newest version of WordPress which will take some time due it is very low in my To Do list of pending tasks. After some time of “blogging” constipation I finally had a chance to sit down and think about something rather basic as well as important. When people in general do things, most of the time those activities are looking to achieve something. I guess this is the most primitive idea behind Newton’s law of motion which I am not going to discuss on this writing but just assuming it could be applicable for this matter. Three laws of “blogging” mapped to Newton’s motion laws. What about my blog categories? I should not be to worry about this topic since this is my third blog entry so far and I am pretty sure there is not to much to categorize with this minimal “blog” production ;( but “BLOGS CATEGORIZATION” is certainly a good topic to talk about. Well I am not referring to the fact that most blogging platforms support “Tagging and Categorizing” your blog entries such they can be organized and presented in a particular manner for future reference but to the fact that those categories would have a meaning or will perhaps be driving behavior in respect of the particular blog purpose. oooohh, I guess I just touched a weak point about my blog site, Do I really have a purpose for my blog defined? I guess I should but that is another topic for a later time of inspiration. Ok, so far without doing any significant research effort about this matter I have found (empirically) three major categorization approaches. I know there may exists many more but I will restrict today’s writing to those I believe I would be looking at first. I have a blog, now what? I am not sure if this particular “blog” entry will be even read by someone outside my family of four including my two little ones who are not even teenagers yet but here I am, just after one day of successfully replacing my old boring and outdated “fidelvanegas.net” website with a brand new “WordPress” based “blogging” application. NOW WHAT? is the question. Should I write a new “Blog” entry every day? or every week? or every month? … well I had not updated or enhanced my former website for months before deciding to switch and become a “blogger” instead. I guess I will find out what is the best publishing frequency for me along the way but for now I can proudly say “I am an every other day “blogger” well at least for the first two attempts.